Other photos: Salon, Salon, Salon, Salon, Salon, Salon, Galley, Galley, Galley, Dining Settee, Dining Settee, Companionway, Master Stateroom, Master Stateroom, Master Stateroom, Master Stateroom, Master Head, Master Head, VIP Stateroom, VIP Stateroom, Guest Stateroom, Guest Stateroom, Guest Head, Guest Head, Crew Quarters / Guest Stateroom, Crew Quarters / Guest Stateroom, Crew Head / Guest Head, Flybridge Stairs, Flybridge, Flybridge Helm, Flybridge Helm, Flybridge Settee, Wing Station, Wing Station, Cockpit, Cockpit Canopy, Engine Room, Engine Room, Engine Room, Engine Room, Engine Room, Engine Room, Engine Room. JOLLEY ROGER is a 2006 Hatteras 68’ “Enclosed Bridge” Convertible Hatteras that is powered with Twin Caterpillar 1800hp & Twin 27.5kw generators. There are four staterooms with four heads along with a very large salon that has a U-shaped leather couch to port and a galley and dinette just forward of the salon. The interior staircase from the salon leads to the enclosed bridge. JOLLEY ROGER offers a 217 square foot fishing cockpit along with a raised mezzanine. This area has teak flooring and a fighting chair. As you make your way from the mezzanine through a sliding door you enter into a 21’ 6” very wide salon. For a 68’ convertible or yacht this beam is extremely wide and offers great space. There is new carpet throughout. To the port has a large U-shaped new leather couch. The TV is to the starboard side and can be viewed in the down position while running or can be viewed in the up position. Just forward of the salon is the very large galley to the port. It is a U-shaped area with granite countertops. The dinette is to the starboard. JOLLEY ROGER has four staterooms below with the master being mid ship and full beam. Large port hole windows, king size bed and access to the master head to the starboard side. Large walk in closet to the port. As you make your way out of the master there is a day head to the port side along with the port stateroom. This stateroom offers a single bunk and plenty of storage. To the starboard is a VIP stateroom with two singles that will slide together to make a larger bed. This stateroom offers it own private head and shower. Just forward is the bow stateroom that offers a bed centerline with walk around sides and plenty of storage throughout. This stateroom offers it own private head as well. JOLLEY ROGER has an enclosed bridge that is access from the salon through an interior staircase or from the mezzanine where there is an aluminum ladder that is angled for easy access to the aft flybridge. The enclosed flybridge has an L-shaped raised seating area to the port with a granite triangle table. There are two riding seats to the port and starboard of the center line helm chair. The helm offers all the electronics necessary for any adventure. The large aft window goes up and down to allow fresh air into the bridge area and there are two opening hatches in the ceiling. 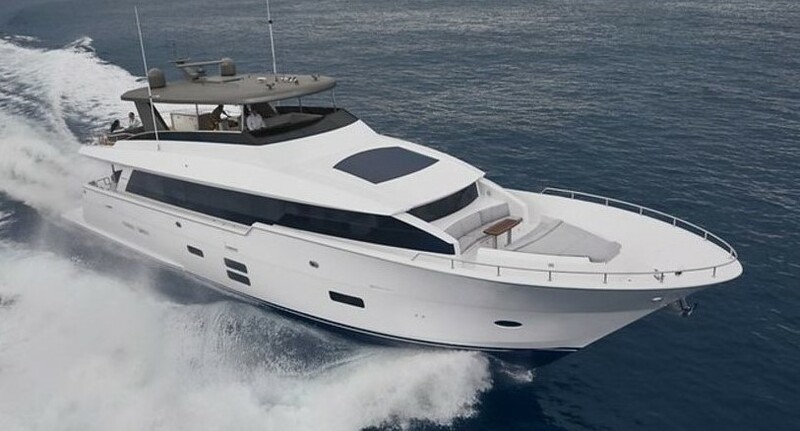 The sliding door to the aft area of the flybridge offers a bench seating and an additional helm. JOLLEY ROGER is located in Ft. Lauderdale and easy to see. This is one of those fishing yachts that raises fish and allows the owners to enjoy the interior and comforts of a motor yacht.